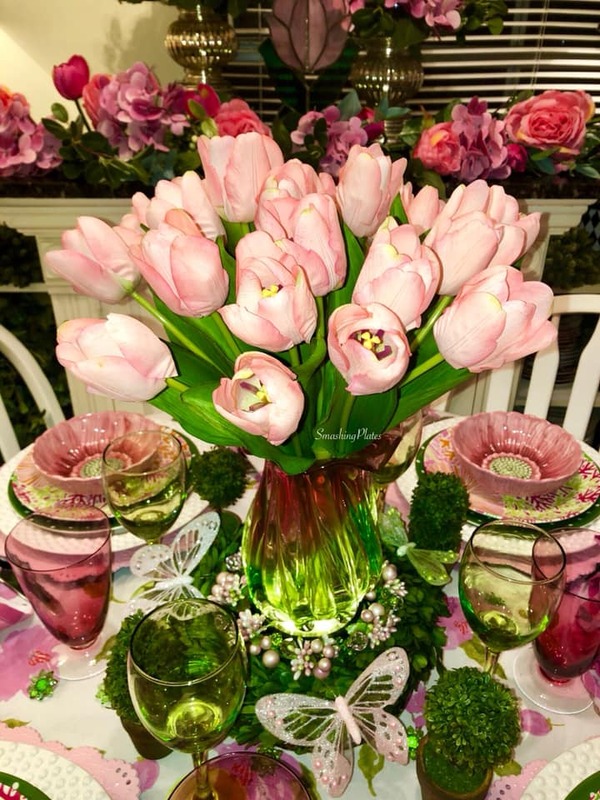 Tomorrow is the first day of Spring and I'm sure most of you are looking forward to Spring blooms and warmer weather. We are already experiencing Summer temperatures here in So. Florida and it feels like we skipped right past Spring. 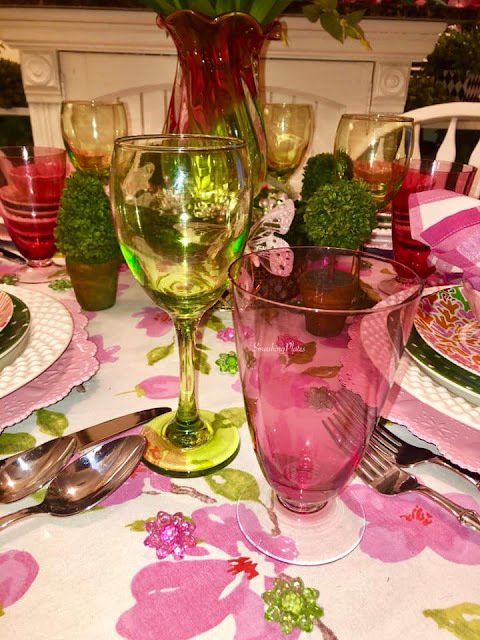 I am currently in love with pink and green everything so I really enjoyed styling the Spring tablescape. The color inspiration started with the silk real touch pink tulips and a heavy leaded glass green and pink vase. 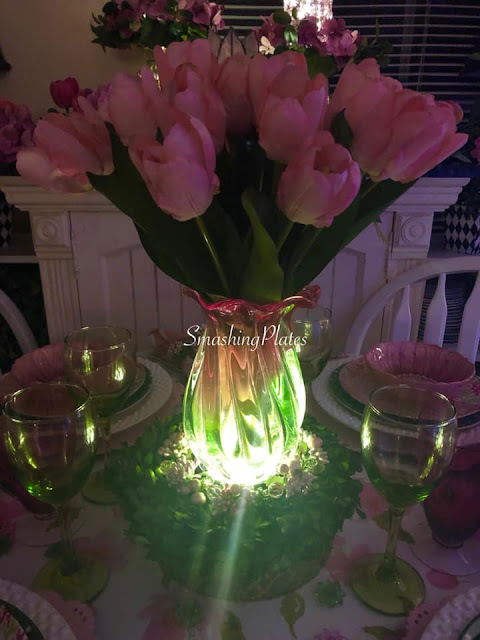 The silk real touch tulips are from Lisa Robertson . 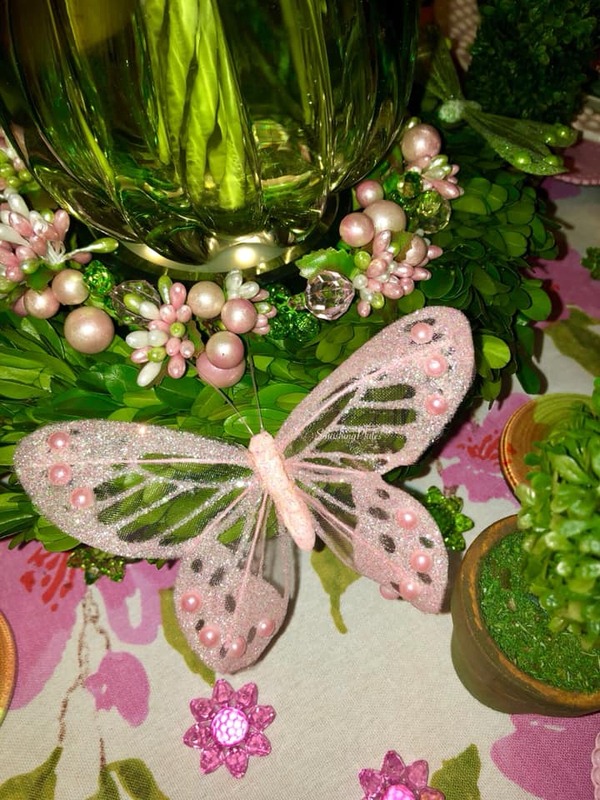 The beaded butterfly clips added to the boxwood wreath are from Valerie Parr Hill. 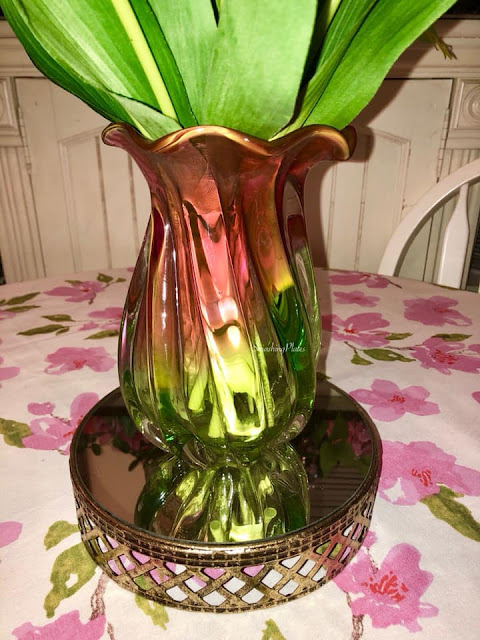 I discovered this beautiful leaded glass vase at a local indoor community garage sale this past weekend for $2.00. 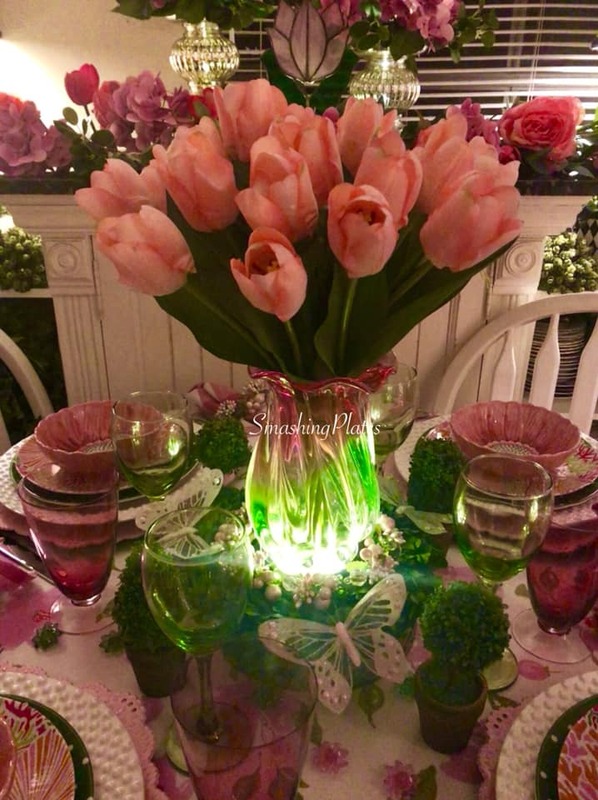 I had already selected another vase for the tulips, but I knew this one would be perfect for this table. 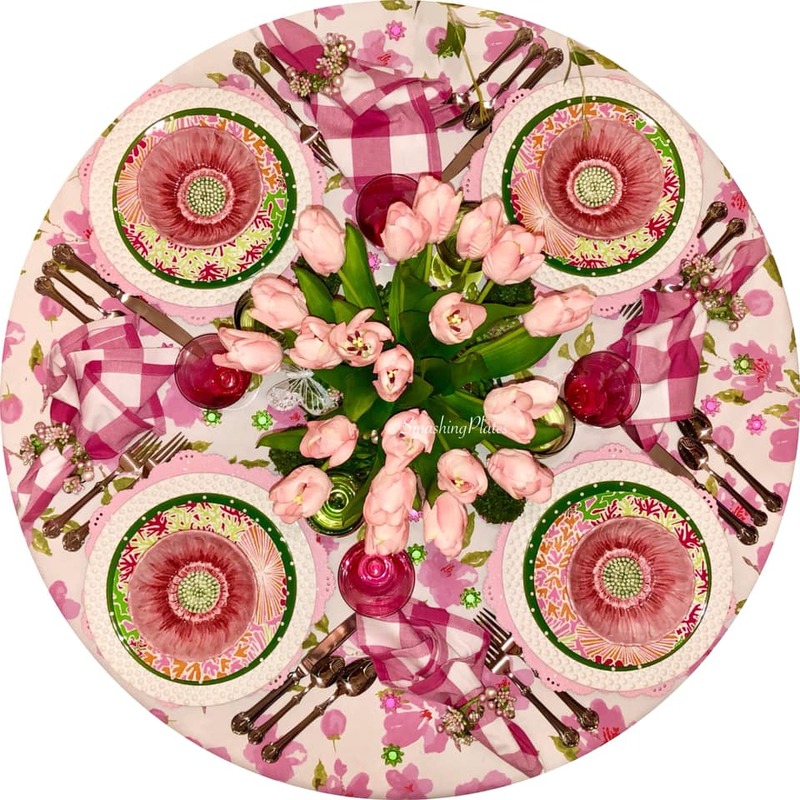 The fuchsia buffalo check dinner napkins are new this season from Valerie Parr Hill. I love them so much I may need to order a few other colorways. I used beaded napkin rings from Valerie. I used grassy green Dollar Tree wine glasses with pink goblets. I discovered these beautiful pink goblets last weekend at a thrift store in Boca. One had a sticker that showed they were made in West Germany. 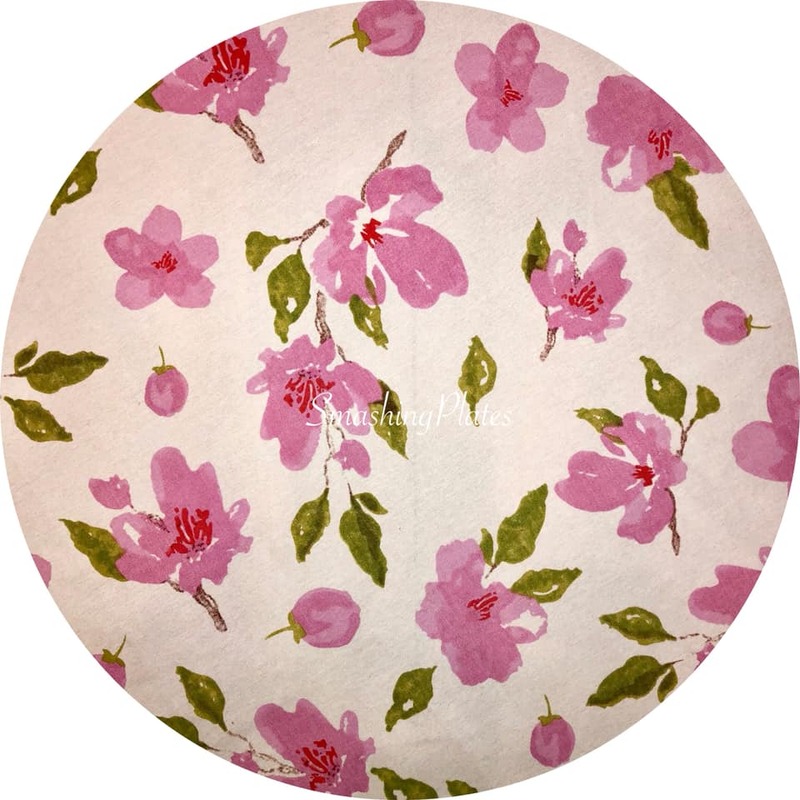 The floral tablecloth was found at TJ Maxx a couple weeks ago. 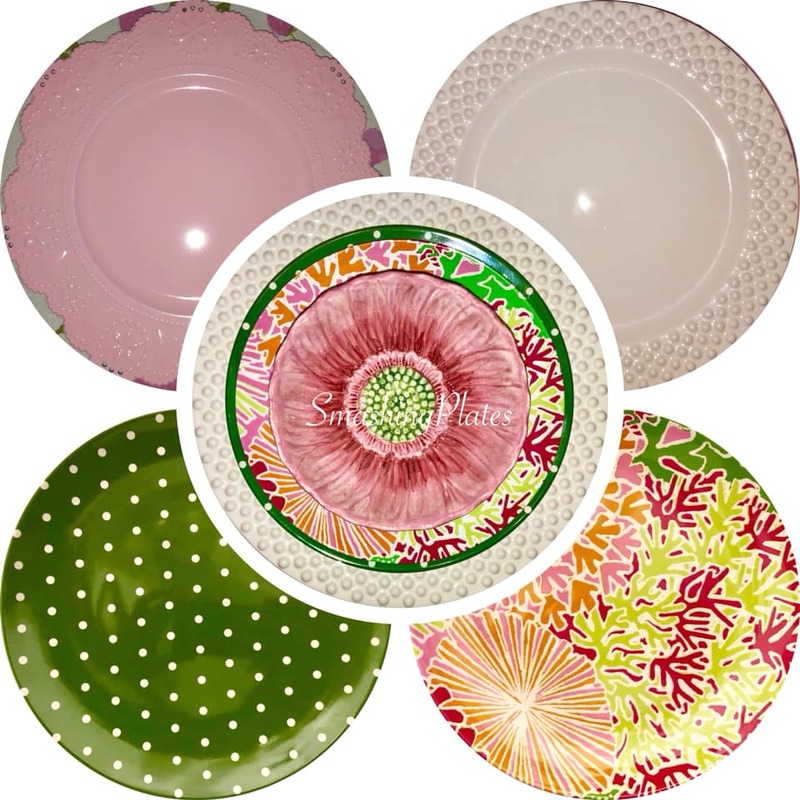 The plate stack stars with a pink charger plate from Michael's this season. 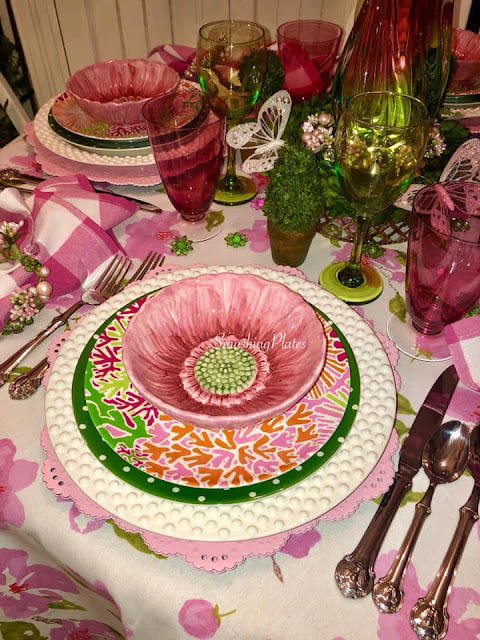 The plates are from HomeGoods. The green salad plate is by Kate Spade. 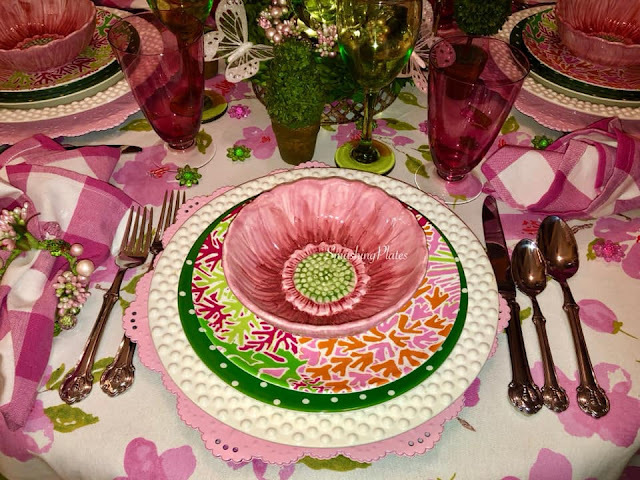 The floral plate is Issac Mizrahi. 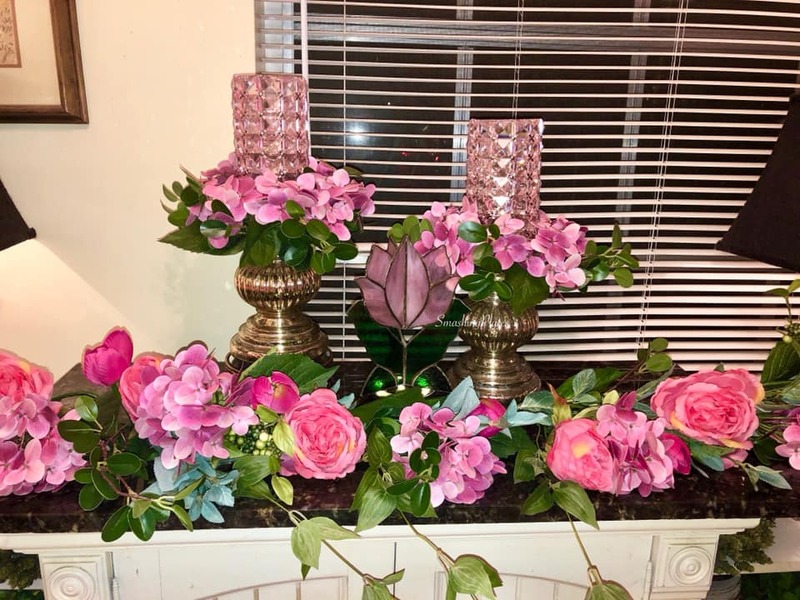 I topped it a pink floral bowl also in store at HomeGoods now. The pink hydrangea peony and tulip floral garland and candle rings are by Valerie Parr Hill Spring collection. 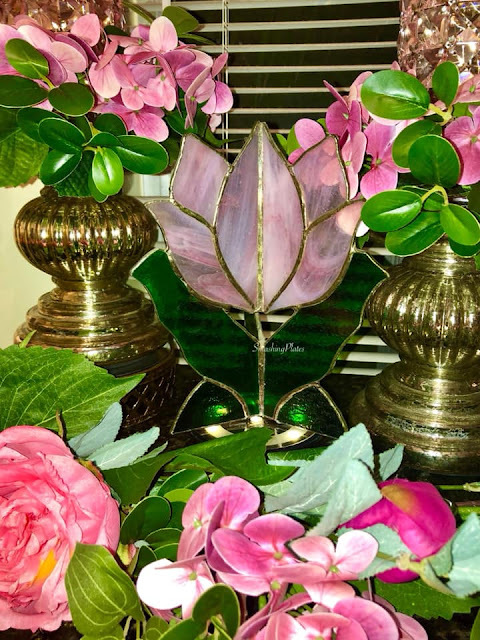 I made the stained glass tulip many years ago for my Grandmother. 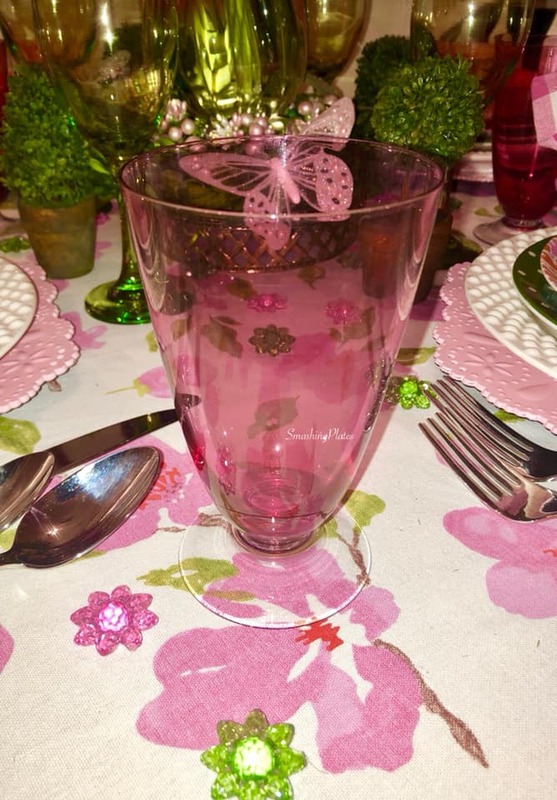 The pink illuminated faceted glass hurricanes are from Valerie Parr Hill. The pedestals are also part of Valerie's collection at QVC. 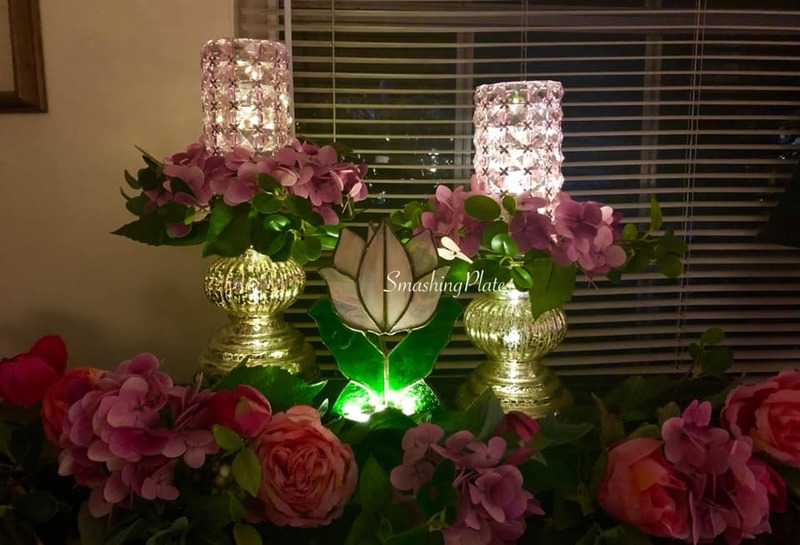 Evening view of the table and server. I used a battery operated light spot under the glass vase. Thank you so much for stopping by for a visit! I really do appreciate it. 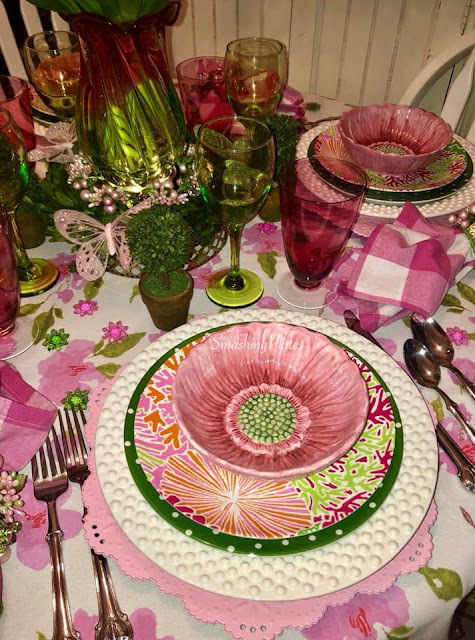 Love the hot pink and vibrant green colors on your table! Makes me long for more color everywhere, although my daffodils are giving me many shades of yellow and orange. Thank you Sandra. 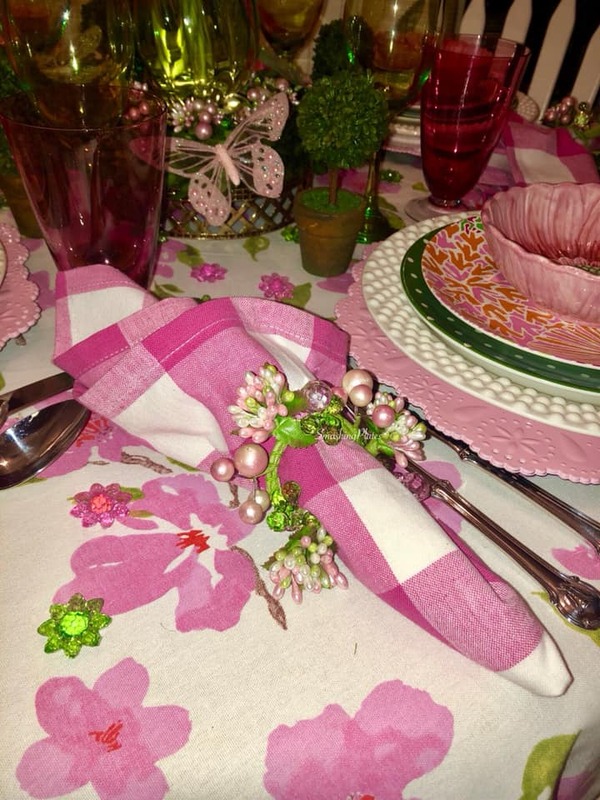 I'm loving pinks and greens this season. I miss having tulip and daffodil bulbs. They will not grow here in the Florida sand. Enjoy your Spring! 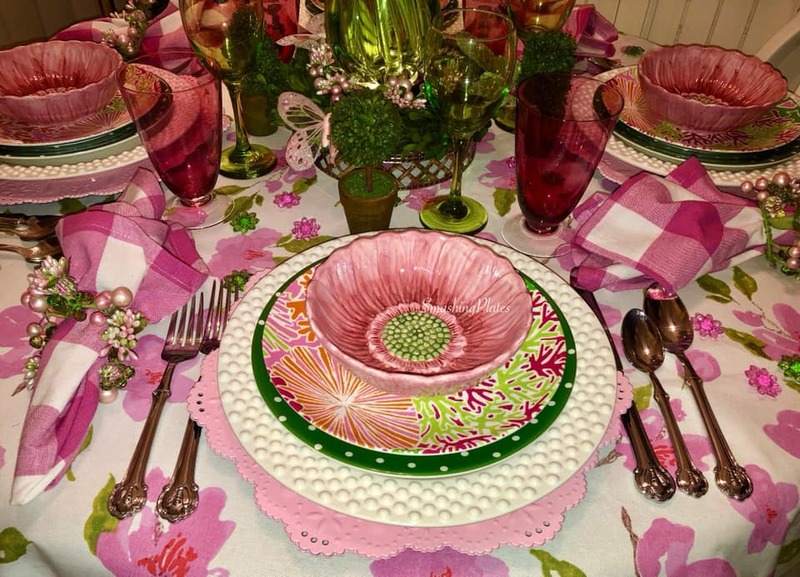 The pinks and greens look good together, especially for spring. Thank you Kristie. 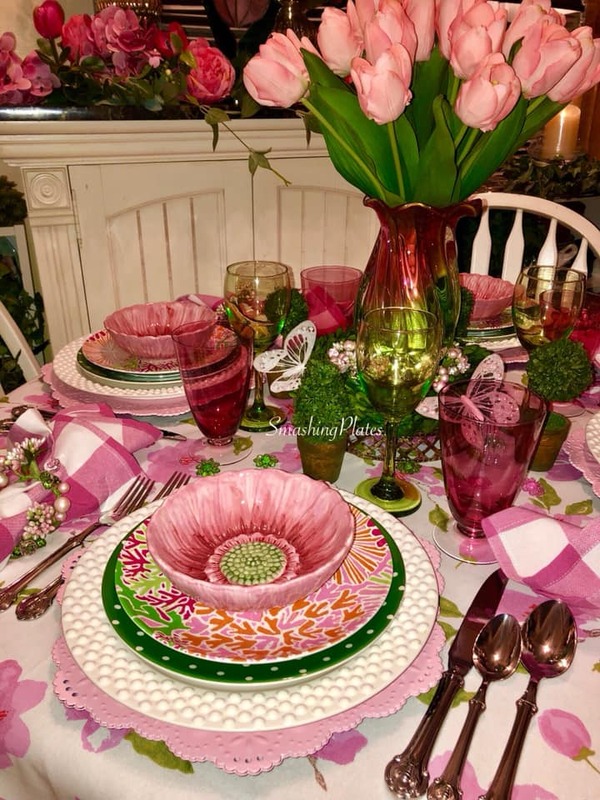 I'm in love with pink and green this season. Cannot wait to style another table in these colors soon. 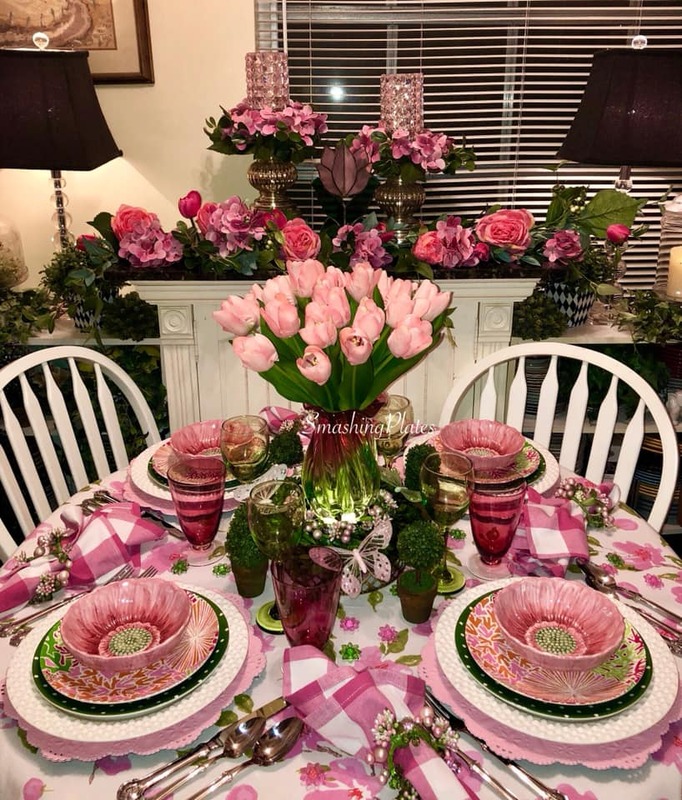 Wow, what an inspiring pink tablescape! I love the spotlight under the vase... looks lovely! 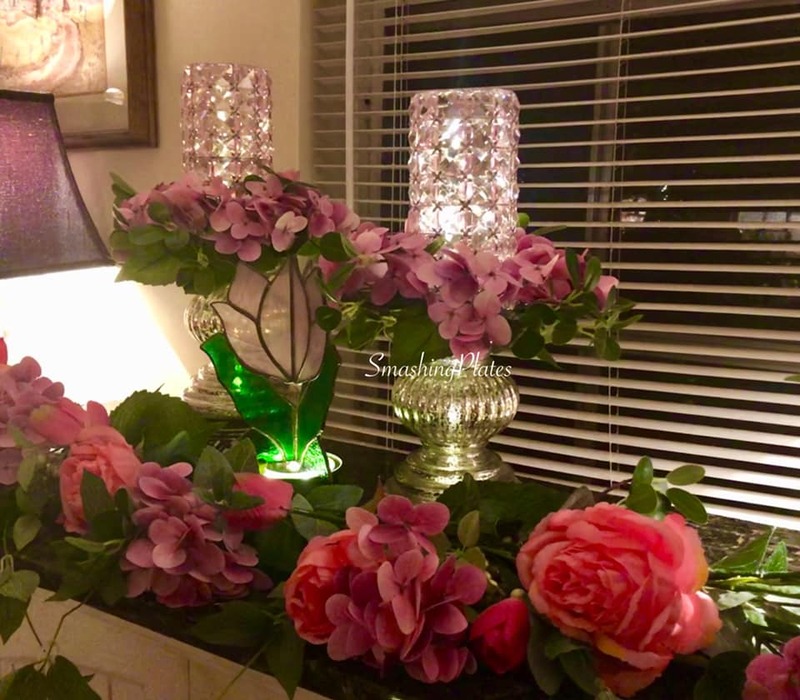 Thanks for sharing at Homestyle Gathering, Catherine! 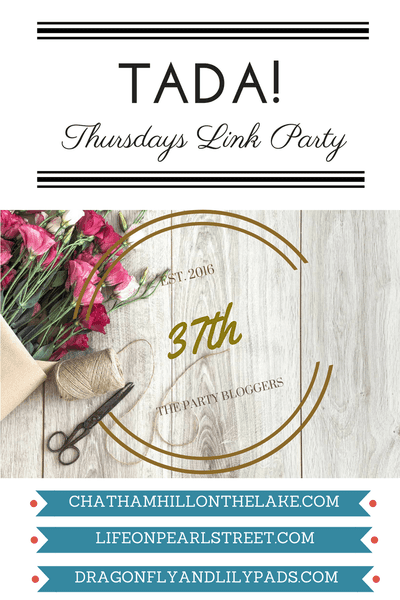 Hope you join us next week, and each week! 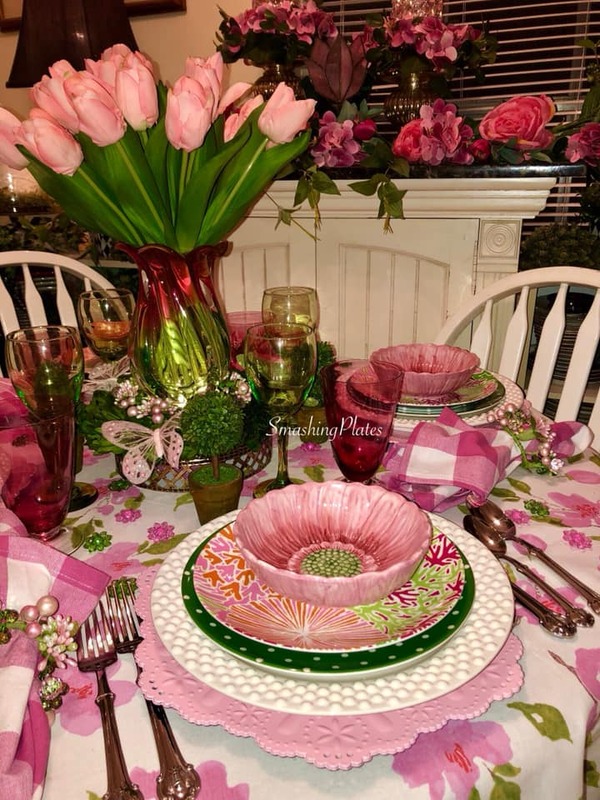 Thank you Catherine for linking up with Celebrate your story...and I want you to know that Your beautiful tablescape of spring tulips was one of my picks. You ca see it at 8 pm on Monday evening. Thanks again. 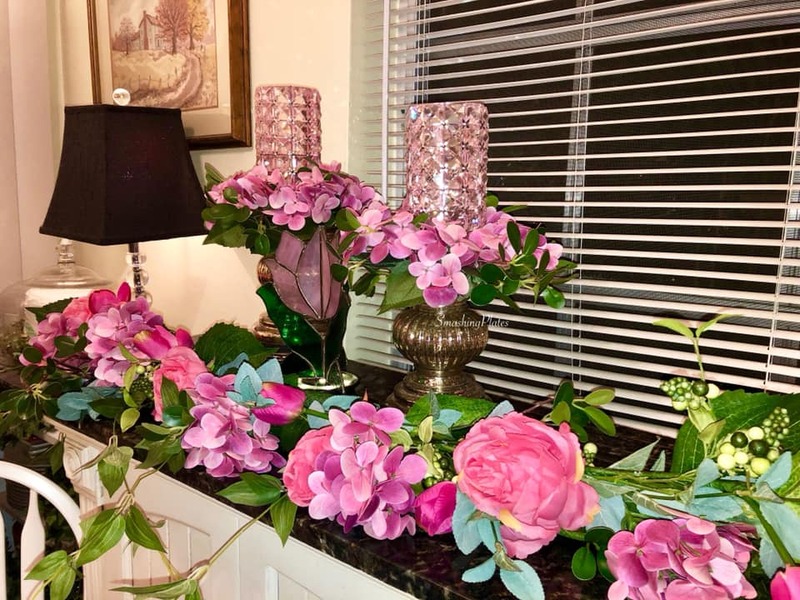 Happy Pink Saturday, Catherine. 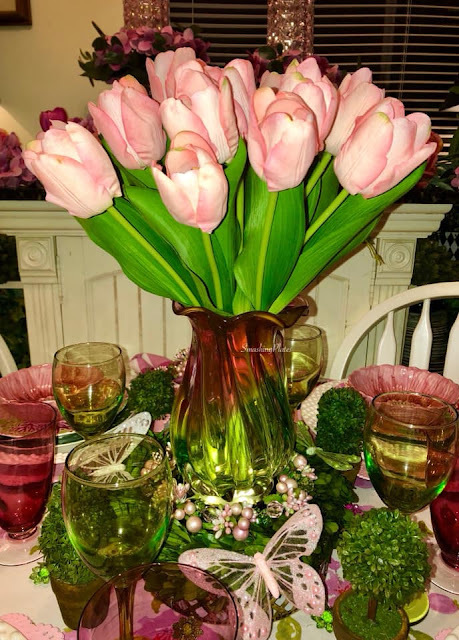 Thank you for joining us to make Pink Saturdays special.